Help us to protect the rainforest by joining us for PHASE 2 of our project - the building a refugio, a center for scientific studies, education, and responsible eco-tourism where people can come to learn and heal by the power of nature. Phase 2 of the fundraising project is to build a refuge to accommodate local and international visitors for the purpose of eco-tourism and rainforest education. Through this, we continue to support the conservation of the rainforest and the region. Bosque Medicinal and Forest.Ink have already established a partnership with the University of Azuay in Cuenca. Students and professors from the faculties of biology, psychology and tourism are involved in exploring the rainforest and incorporating these explorations into their studies.We are raising money to build an appropriate structure in order to house them during their expeditions to the rainforest. This will give the opportunity of extended stay in the rainforest in order to learn about sustainable living, plant and animal diversity.The structure will be a refugio including a dormitory for volunteers and visitors, community living space, a kitchen and a classroom. As well as hosting local students, the objective is to create space to receive international students also. European students studying ecotourism will be invited to participate in this project, to learn about the rainforest and to contribute to future projects. The long-term goal of building this refugio is to open this small pocket of the rainforest for sustainable eco-tourism. 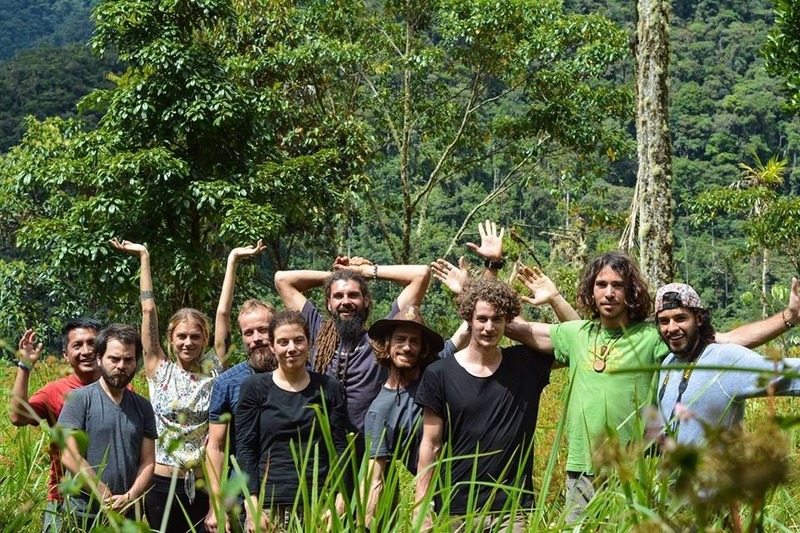 Inviting adventurous travellers from around the world expands possibility of spreading the awareness of this precious ecosystem and its importance.The organizers of Bosque Medicinal will offer eco-tourists an unforgettable rainforest experience that will increase the love and dedication to our natural resources. This will involve wild expeditions into the jungle to explore waterfalls and natural medicines growing in their natural habitats.Building a refugio to support eco-tourism will also directly economically support this project in the long term, making it self-sustainable. At the heart of all of this fundraising is Bosque Medicinal’s main objective of being guardians of the rainforest. Conserving the rainforest and its original diversity is at the center of all current and future fundraising of Bosque Medicinal.Thank you for your involvement in protecting the world’s most diverse ecosystem. Thank you for your help and support as we continue to piece together the elements required to bridge the world between the humans and nature, and thank you for your help as we prepare for Phase 3: expanding our services into Europe.On our website you can learn more about the different phases of our fundraising project: the purchase of land in Ecuador, the building of a refugio and our expansion into international services. Bosque Medicinal is a rainforest preservation project located in the Ecuadorean Amazon. The collective effort of the Bosque Medicinal team is to raise awareness of the importance of the rainforest’s biodiversity. This ecosystem is one of the most diverse in the world, connecting some of the world’s most important resources. Bosque Medicinal understands that caring for water, natural medicines and the world’s biggest source of oxygen means caring directly about the interconnectedness of the human being. Bosque Medicinal is dedicated to protecting the rainforest, seeding new trees and participating in reforestation projects. We are also involved in educating children and adults alike about the flora and fauna of the rainforest and the importance of these ecosystems. Forest.Ink is a fundraising foundation that is dedicated to supporting the new world paradigm. We connect traditions, communities and organizations that work towards building a healthier and happier world. By investing in the construction of educational facilities, rainforest preservation projects (e.g, Bosque Medicinal) and other necessary programs, we hope to encourage the reconnection to the importance of nature. Our understanding is that what begins in the self will manifest in the entire universe around. Collaboration and participation are the necessary ways to facilitate lasting change for a more conscious life, for realizing the self and for attaining our dreams. May the Universe help us in our work that is coming from the bottoms of our hearts, from the natural desire to care, protect and learn from the Mother Nature. There are trees living on the same planet Earth with us, so let´s live peacefully together with them. May yoube healthy, people of goodwill. Que el Universo nos ayude en nuestro trabajo que viene desde el fondo de nuestros corazones, desde el deseo natural de cuidar, proteger y aprender de la Madre Naturaleza. Hay árboles que viven con nosotros en el mismo planeta Tierra, así que vivamos en paz con ellos. Que sean saludable, gente de buena voluntad.Nechť nám vesmír pomáhá v našich činech, které pramení v srdcích našich, přirozené touze chránit, pečovat a učit se od matky přírody. Na stejné zemi co my, žijí s námi stromy. Tak pojďme v klidu být, v míru s nimi žít. Iriška Kamenný Vesmír a spol.